Nicola L. C. Talbot, LaTeX for Administrative Work. Dickimaw Books, 2015, xiv+637 pp. Paperback, US$33.99. ISBN 978-1-909440-07-4. Also available from http://dickimaw-books.com/latex/admin/; released under the GNU FDL. This is the third volume in Nicola Talbot’s LaTeX series published by her own Dickimaw Books (http://dickimaw-books.com). These books fill an important void in the LaTeX literature. A combined review of the first two volumes was published in TUGboat 35:1 (2014) and on the TUG web site at http://tug.org/books/reviews/tb109reviews-talbot.html. Let me start with a personal reminiscence. In the middle of the 1990s I decided to learn about all LaTeX packages and spent several days studying the documentation for all packages in the macros/latex directory on CTAN. This was an interesting exercise. Unfortunately, now, two decades and many talented CTAN contributors later, it would be almost impossible. At the very least, it would require a much longer time just to read through the descriptions of all the packages. On the one hand, this abundance is a good thing: it indicates the health of TeX and the LaTeX community. On the other hand, however, it poses a problem: how can one find the package that fulfills the given task? Probably many TeXnicians have had the embarrassing experience of re-inventing the wheel: writing code duplicating the functionality of an existing package (I myself certainly have!). The TeX Catalogue at http://texcatalogue.ctan.org/ is of great help, but sometimes a keyword search is just not enough. Also, the Catalogue, by design, presents a neutral point of view. A practitioner often needs a guide to a curated collection of packages, where one can find the discussion about different ways to perform the task, advice about the best methods, pitfalls and bugs, etc. For many years the invaluable LaTeX Companion series used to be such a guide. However, since the last edition of the Companions there have been many changes in the LaTeX world. There are new tasks and new ways to deal with them. Thus new books are needed. Nicola Talbot has a clear writing style and a great knowledge of TeX. She is the author of many useful packages. Thus she is well positioned to produce this guide to the modern LaTeX. The first and especially the second volume in the Dickimaw series look like an attempt to write such a guide. I am glad to report that the third volume is of the same high quality as the first two. The title of the volume may require some explanation (actually the titles are the most problematic aspect of the series; only the first book fully corresponds to its title). It seems that by “administrative work” the author means repetitive tasks, those that could (and should) be automated. 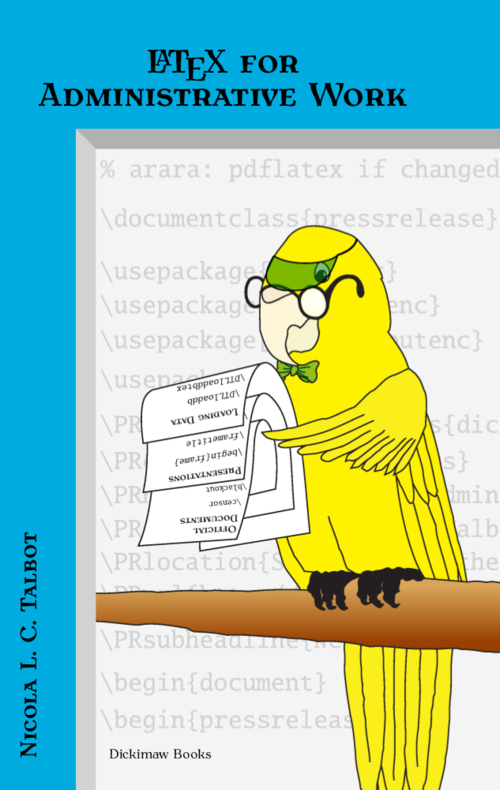 The book describes such tasks as processing data, creating correspondence (including mail merging), invoices, résumés, memos, minutes, presentations, exams and tests, business cards, flyers, letters, filled forms, charts, bar codes, as well as date and time formatting and even version control systems and their interaction with TeX. It has a separate chapter on online LaTeX editors and the ways to organize joint work on a LaTeX document with less TeX-savvy colleagues. For each task the author describes the CTAN packages that help to solve the problem. She tries to use only the packages that both exist in MiKTeX and TeX Live and have English documentation. The book discusses the main features of the packages, compares their strengths and gives recommendations about their usage. While reading the book I wished time and again that I had had it earlier: it would have saved me much time and effort. The task-oriented approach adopted by Nicola Talbot has its advantages and disadvantages. Its main strength is that it gives the reader a hands-on understanding of the concepts, and a novice always knows why she is asked to learn what’s at hand. This may be preferable here to a common alternate approach, where a book first describes a set of language constructs, and only then shows how these constructs are used. However, the present approach does sometimes prevent systematic exposition. For example, the book explains how TeX expansion works, with the (in)famous \expandafter in the chapter about reading and processing data from databases. A (quite interesting) lesson on package writing is placed in the chapter about making fillable forms in LaTeX. Random number generation is discussed in the context of typesetting exams and tests, and so on. The book strives to be both a textbook and a reference book, but sometimes the different requirements of these different kinds of texts clash. Perhaps it would make sense to repeat the notes about TeX and LaTeX programming in a separate volume intended for aspiring TeXnicians. The advent of LaTeX3 with its completely new programming paradigm makes such a book with chapters on TeX, LaTeXe and LaTeX3 quite appropriate. It is rather difficult to write a book interesting for both novices and more experienced TeXnicians. Nicola Talbot has this rare skill: while the explanations are lucid and should be understandable to all users, some tricks (like the use of \@afterheading to overcome LaTeX’s tendency to redefine \everypar) are not trivial and could be quite illuminating even to seasoned TeX programmers. It is inevitable that the choice of material reflects the author’s tastes and views. For example, this book includes the chapter on résumés: is their typesetting logically an “administrative work”? In the same vein, beamer is even less related to administrative work and is well described in several recent books, so it might be omitted here (perhaps this chapter would be less out of place in the second volume of the series, intended for graduate students). Nevertheless the book does have an underlying idea, and one can elucidate the general principle the author used in the selection of the material. The choice of packages also reflects the author’s tastes. Most of the selected packages are quite important, like datatool and datetime2 by the author herself, and etoolbox by Philipp Lehman and Joseph Wright. On the other hand, there are some unfortunate omissions. For example, the author describes the trusty but old picture environment, but does not mention the pict2e package, which eliminates many limitations mentioned in the book. Another unfortunate omission is the indispensable latexdiff program, which is quite useful in conjunction with the version control systems discussed in the book. The typesetting of this book, as of the other books in the series, is very good. A book about a system for making beautiful texts should strive to be beautiful itself, and Nicola Talbot understands this well. The book has generous margins used for references and marking input and output. The author uses a nice typographic device to show the different levels of the text, marking them with different symbols. While this marking has been used in TeX books since The TeXbook, the idea to put the same symbols in the table of contents is relatively novel. It allows a reader to map her own route through the book according to the needs and the level of expertise. The volume includes a bibliography of 151 titles, a short (in my opinion, rather too short) glossary, a summary of commands and environments with useful explanations and sources for each command, and a detailed index. Perhaps a running index for all three volumes in the series published so far would be a good addition. The book has many exercises ranging from simple ones to full blown projects. The book is free (as in free speech): it is published under the GNU Free Documentation License and is available from the author’s web site (http://dickimaw-books.com), along with the other volumes in the series. Instructions there also tell how to obtain a printed and bound copy. My copy was made by Lightning Source Ltd.; the paper and binding are very good—the latter being rather important for a book of this length. This volume, as well as the previous two volumes, deserves to be on a bookshelf of any serious LaTeX user. The series can be of considerable interest to a TeX educator: it would be quite feasible to create courses for students at almost any level from novices to advanced users using different chapters of the books. The presence of exercises makes this task easier, and the free license allows students with limited means to download the textbooks.